There are many ways to engage with a movie, as there are with any kind of art. A particular film can give the superficial pleasure of an entertaining distraction; it can touch us on any number of emotional levels – “you’ll laugh, you’ll cry” … It can elicit an intellectual response, or touch the viewer aesthetically. And sometimes a movie will burrow so deeply into us that it captures us on multiple levels and affects the ways in which we see and respond not just to the movie itself but to the art of film and, in fact, affect our own experience of reality. 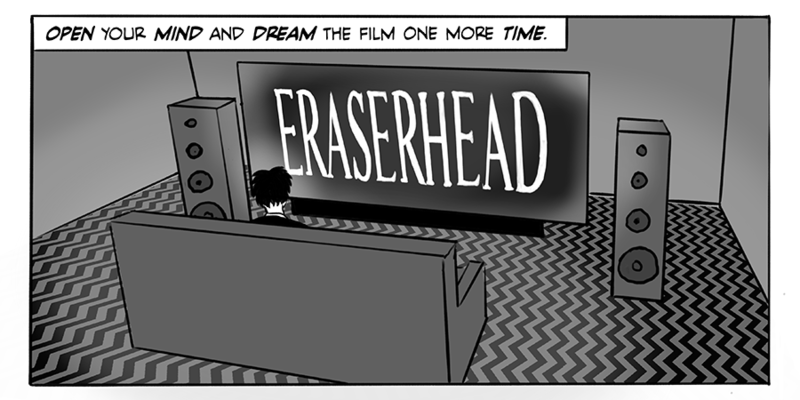 Visitors to this site are perhaps aware of my own obsession with David Lynch’s first feature, Eraserhead (1977). This strange, disturbing movie took hold of me so deeply when I first saw it in the summer of 1980 that it ended up altering the course of my life for (at least) several years. My engagement was emotional, intellectual, aesthetic … I spent something like a year-and-a-half trying to come to terms with the way Eraserhead made me feel when I watched it, first by writing an exegesis of the film’s meanings as I understood them, then through research and interviews with Lynch and his cast and crew to learn the story of the film’s genesis and production. Does David Lynch offer hints to the meaning in his Eraserhead Stories monologue? Very few movies have engendered such a deep response in me (the work of Tarkovsky, some of the films of Theo Angelopoulos and Bela Tarr), but none have pushed me to such a sustained critical effort. 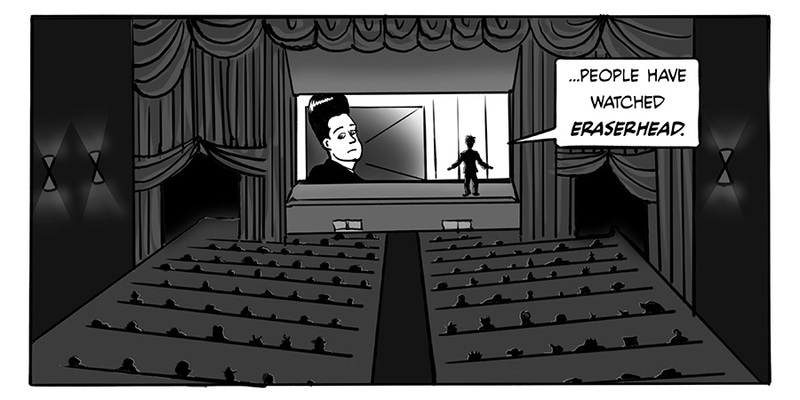 In this sense, Eraserhead still stands as a unique experience in my now many-decades-long love affair with movies. All of which is preamble to my recent encounter with someone else who shares this particular obsession, although his approach to the film is very different from mine. Like me, Jon Fairhurst was driven to understand Lynch’s movie; but where I attempted to analyze it from the inside out, he has sought to understand the sources of Lynch’s imagery, finding clues in a particular pre-existing text. Having made the initial connection by chance, Fairhurst has applied a close textual analysis to uncover words, phrases, images and themes which, he feels, link that text (I avoid naming it here in deference to his work and the surprise revelation contained in it) to specific images and thematic parallels in the film. I have always been a bit skeptical about tracing such specific connections between one creative artifact and its possible sources, particularly in the case of something as distinctive and peculiar as Eraserhead, because the act of creation is more complicated and ineffable than is implied by the appropriation and reconfiguration of prior elements into a new arrangement. Of course, any work of art has influences, but the specificity of the details Fairhurst lays out in his Key to Eraserhead, while provocative, would need confirmation from Lynch himself both that he had an intimate knowledge of the text in question and that he consciously drew on it when creating the film. While at this point that question remains unanswered, Fairhurst’s method is fascinating. 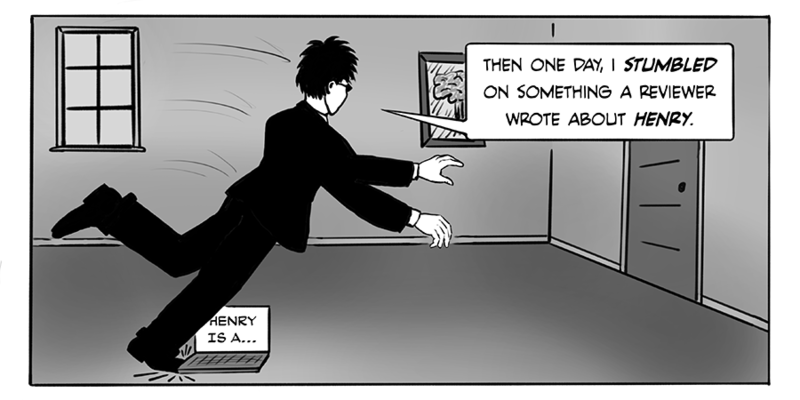 He hasn’t written an essay laying out these parallels, but rather presents his argument in the form of a graphic novel. Structurally, this falls into four parts – an introduction which provides the background to his own discovery of the text in question and what he sees as suggestive hints Lynch has provided about the connection (particularly in his lengthy Eraserhead Stories monologue, included with the DVD and Blu-ray editions of the film); a lengthy exegesis in which he provides evocative representations of images from the film accompanied by specific quotes from the text; a shorter section which layers elements of a secondary text over this synthesis; and finally his own interpretation of the film’s meaning. The Key to Eraserhead is visually striking, its high-contrast black-and-white panels evoking and commenting on the film’s imagery. Fairhurst’s attention to detail cannily supports his argument while remaining suggestive rather than assertive, as a straightforward essay would be. As a form of criticism, his approach raises the question of textual influence but leaves room for the reader to weigh the implications. Ultimately his own interpretation of the film, presented in the final section of the graphic novel, goes beyond the meanings of his proposed source text and is instead rooted in the actual imagery, structure and imaginative details of the film itself. The Key to Eraserhead lays out Fairhurst’s way into the film, but in the end it is Eraserhead itself to which he responds … which is just as it should be. For fans of Lynch’s work, and those interested in exploring Fairhurst’s original approach to film criticism, The Key to Eraserhead is being released on March 19 as an ebook on Amazon and iTunes. Definitely not by coincidence, this marks the 40th anniversary of Eraserhead’s first public screening in 1977 at Filmex in Los Angeles. 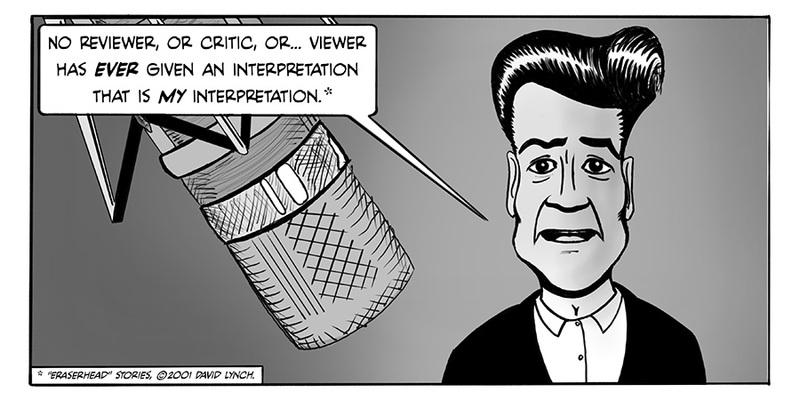 This entry was posted in Commentary and tagged David Lynch, Directors, Eraserhead, Film Criticism. Bookmark the permalink.